Hello hello, lovely folks, it’s sure been a while! While Jenny and Melody are heading into an Australian “autumn” (which is hotter than your typical British “summer” day), I’m currently in the chilly and utterly amazing coastal city of Helsingør in Denmark, known in English as Elsinore. The name sound familiar? 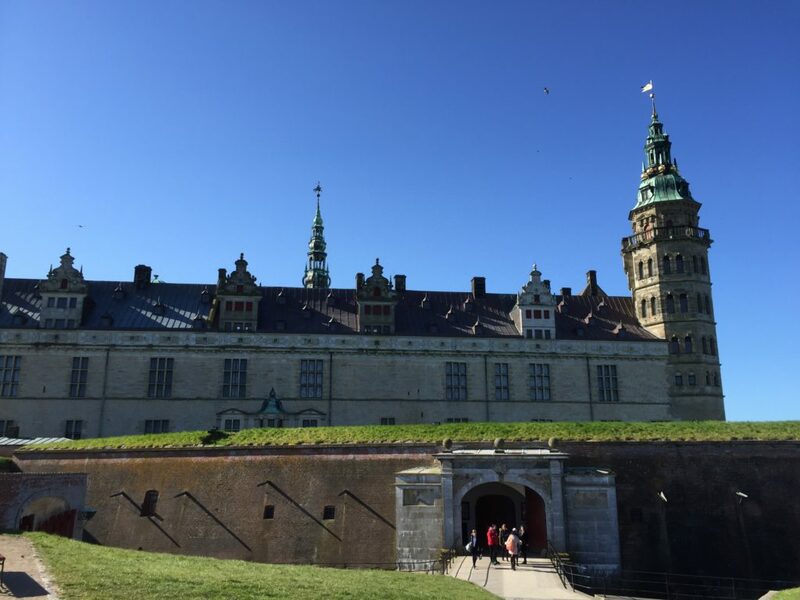 If so, you might’ve encountered it before in the form of Shakespeare’s Hamlet, which features a castle based on the real-life Kronborg. Yup, that’s where I’ve been spending the last few days as part of a Shakespeare conference–and yup, it has been geeky and awesome beyond words. In fact, today (23 April) marks the 400th death anniversary of the Bard, and forms the epicentre of a year-long celebration, with all sorts of amazing events held all over the world. On this monumental day, I’m thrilled to announce our next project: a Shakespearean game for iOS (and possibly Android) entitled Shax. As you the title suggests, this is a very playful–and sometimes irreverent–game, and aims to be funfunfun rather than “educational”. While it is also rather different from Regency Love in many ways, Mel and I have gone back to some of our earlier Regency Love-inspired design concepts, and are having a blast making this game. We hope you’ll consider giving Shax a go when it is released (we don’t have a confirmed date yet, but are looking at roughly 2016/2017)–writing this game has been so much fun, and I hope you’ll get to enjoy it, too! 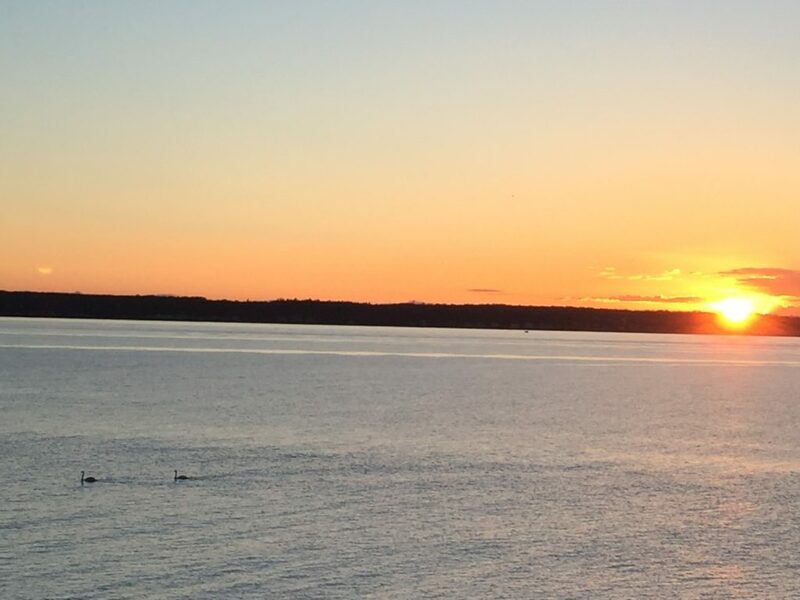 I caught the sunrise this morning on Shakespeare’s 400th deathiversary–and then these swans appeared! On a final note, for those who are wondering: yes, the Lord Sutton novel is being written, slowly and surely–just like how his affection for a certain lady grows. This has been quite an extraordinary year for us at Tea For Three Studios, and especially for Regency Love: we’ve somehow managed to double our number of players (thank you to all the awesome folks who’ve helped us spread the word—you know who you are! :D); we released our first in-app purchase in the form of Mr Graham’s story; the Wikia we set up has been filled with information, courtesy of our lovely contributors; some wonderful fans have made a page for us on Wikipedia; our game now has an iPad version; and, most importantly, when Samantha swung by our Sydney headquarters, we made (and feasted on) gentlemen-themed cupcakes. As a teeny, independent, and transcontinental studio with three ladies, no funding, very little time, and way too many ideas, making the game was certainly a labour of (Regency) love—and we are super duper happy and grateful and touched and warm and fuzzy that you’ve come to love it, too. So, at the risk of yet again sounding like someone stuck practising the same scales on the piano: thank you, thank you, thank you! Although we have many more Regency Love stories to tell and characters to share with you (here’s a list), our current range of commitments and limitations means we won’t be able to work on expanding the game itself in 2016. That being said, we will continue releasing updates to fix any bugs/typos/other nasties as they’re brought to our attention—we certainly don’t want you to be attacked by evil, misplaced apostrophes! Additionally, as we announced on Twitter a while back, we are working on a spin-off novel centred on Lord Sutton. Specifically, Samantha is writing it independently (with feedback from Jenny and Melody, of course), which will eliminate the serious bug-zapping and copious artwork required in a highly interactive and visual novel such as Regency Love, but will still allow you to experience more of the stories and characters we love so much. We’ll be asking for your support in a crowdfunding campaign in order to release the novel—more details are to come (i.e. when Samantha has completed a solid first draft, and has a better idea of a timeline). The rough release date will be late 2016 or early 2017—since Samantha has a PhD thesis to complete and defend in 2016, we’re afraid we can’t be too specific at the moment. What we can say is this: there will be oodles and oodles of Lord Sutton. Perhaps even in compromising situations, if you manage to bribe Samantha (a dangerously easy task). If you want to follow the novel’s progress, please feel free to check out Samantha’s blog or Twitter, where she has been known to get rather carried away. And while you’re at it, please do check out the Interwebsian spaces belonging to Jenny and Melody—there are certainly lots and lots of shinies to discover! Thank you once again for accompanying us on our Regency Love journey this year. We hope you’ve enjoyed it as much as we have, and we are very much looking forward to sharing some epic Sutton-esque shenanigans with you in 2016! And start your next character slot. While many parts of the British Isles are partaking in Guy Fawkes Day with all sorts of fireworkery today, Darlington remains relatively quiet, since Mrs Norris is most vocally against such tomfoolery. 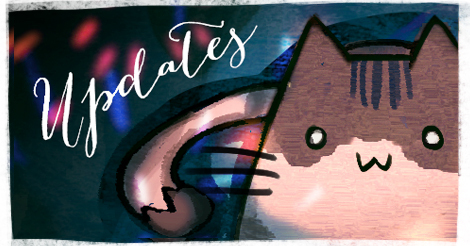 Although we at Tea For Three Studios would be the first to encourage any sort of silliness, we wouldn’t want to disagree openly with Mrs Norris—so we’ve decided to set off some metaphorical fireworks, and hope that with this latest Regency Love update, our sparks will light every corner of your heart! Note: It may take up to a few hours for the update to be available, depending on Apple and/or your country’s App Store, but we’ve released it on our end! Some sneaky polishing of the graphics—and perhaps a surprise or two. Players couldn’t progress in the story despite maxing out their stats, which has been fixed. We want to thank everyone who has contributed to the bug-fixing by contacting us through all sorts of platforms, including our official reporting post. Since our in-game “Report a Problem” button will be a much easier way for you to help us weed out any bugs, typos, and other nasties in the future, we’ll be closing comments to the post—it’s certainly had a good run!